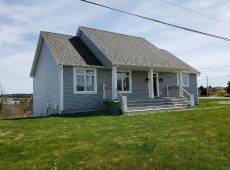 Stunning waterfront views from a gorgeous & contemporary home - 3887 Lawrencetown Rd is situated just 10 minutes outside of Cole Harbour on the tidal Lawrencetown River/Lake! Boasting over 1000' of water frontage, there are always new things to see and explore. The stylish front door leads to an enclosed foyer creating a thermal break to help keep the heat where you want it most. An open concept living room, 9ft ceilings & chef's dream kitchen proves to be a space perfect for family and/or entertaining. Three good sized bedrooms & 2 bathrooms finish off this level perfectly. Downstairs let your imagination soar with an "open canvass" space ready for you to finish in whatever way you like.